And the WOD for Sunday's event is the 54321 WOD!! The Midwest Sectionals provided all the excitement we've come to expect from the CrossFit Games. Both Events were brutal and the some serious competitors have emerged from the ranks. 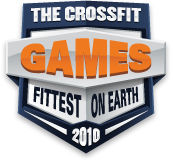 The 2010 CrossFit Games season is upon us. On February 12th, 13th and 14th CrossFit TNT will hold the first Sectional of the year at their brand new box in St. Charles MO.